Garland regularly features the amazing jewellery being produced by women artists in Iran. 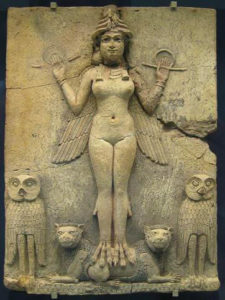 Many of them draw inspiration from the female goddess figures that constitute the complex palimpsest of Persian culture. Here Roohollah Shamsizadeh (Aria Gallery) writes about one goddess who has special relevance to jewellery. Ea, who is also called Enki and Nudimud, is the inheritor of the Apsu, is the deity of ‘sweet waters’ (fresh waters), the supporter of culture, wisdom, craft-men, goldsmiths (jewellers), masonries (sculptors), carpenters and the originator of knowledge. Ea is being depicted in a human body form that from her shoulders or [in another portrayal] a vessel that she is holding, water is springing out and, wearing a cloak[covered like] as scaled. In KudurruKassitesEa’s symbol is a curved cane at the top with a ram’s head which is standing at the top of a platform of a temple which is carried by a billy goat. In the history of Mesopotamia and even other civilisations, the deities and gods were the supporters of humans and various professions. Thus, in a way, supporting a specific profession by a deity attracted attention and the growth [of that occupation] and, form another view, was indicating the importance of the subject matter. The masons (sculptures) and goldsmiths (jewellers) are among the groups who were supported by the deities. Building sculptures and making jewelleries were two important mediums in ancient times. The reason for this attention was because their works were bodily reflection or replication of narratives and myths. Equally, jewels were a symbol of prestige, status, and even rank of deities and persons. The revealed mythologic documents from Mesopotamia including the mythology of creation (Ânuma Elish), the epic of Gilgamesh, the epic Errâ, Ateneh, Adapa, Anzo, the descent of Ishtar, Nirgal, Ereshkigal, and Atrei Khasis, all are about the narratives, stories and/or the role and place of deities of Mesopotamia. 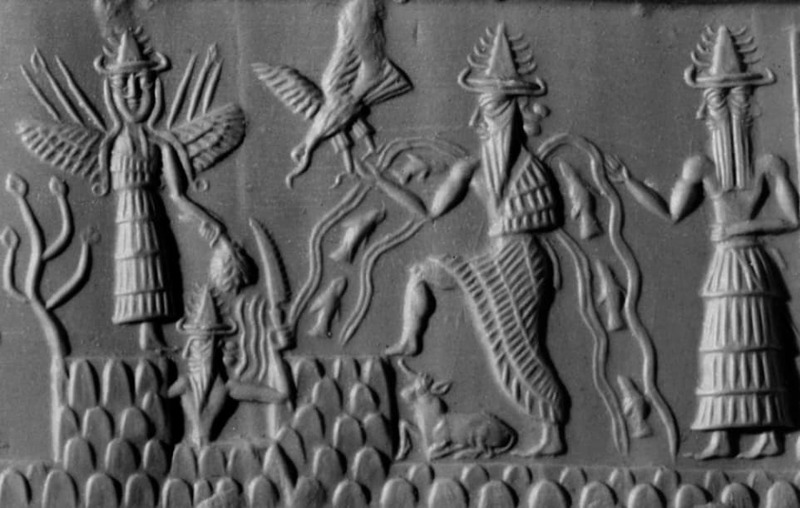 In the narrative of Ânuma Elish which is one of the earliest documents of geographically western Asia (i.e., Mesopotamia and Iran) the trypot of Ânu, Enlil and Ea have distinctive importance and that is because they are the foundation of creation and, they layout the foreground of the presence of humans on the earth. Amid this [mythological formation] Ea, as the deity of knowledge, wisdom and art, she is distinguished as the supporter of craftsmen, masons (sculptures) and goldsmiths (jewellers). In other narratives, it is [furthermore] referred to the role and standing of Ea. In a version of the well-known mythoi narrative in the eleventh tablet (the tablet of storm), the epic of Gilgamesh, a forewarning to “Utnapishtim” regarding the annihilation of people is avowed which [meanwhile] advises construction of a ‘ship’. The gods decide to send a massive storm upon human beings. It is only Ea who disregards the status and stature of [other] gods and makes Utnapishtim aware of the cataclysm ahead: “Abandon your home and make a boat. Leave your belonging and embark on seeking living creatures. Put behind personal possessions and rescue the living ones! Collect the seeds of all living things and put them in the boat. In this manner, the big boat was built in exact. Myths are fundamental symbols and a powerful network of samples which make it possible to interpret and think about the world and its meaning. Myth analysis is one of the methods to develop the mythology which is in harmony with period and the post-structuralist paradigm. This kind of study deals with art work and especially society. By myth analysis, one can examine the discourse of mythical elements in text and its relation with cultural context. “EA” is mentioned as a social myth in ancient Iranian text. The importance of analysis of this myth’s social functions for today’s jewelers is because it offers support models such as “supporting artist”, “supporting the art work”, “supporting the material and supplying raw materials”. Today, this kind of support is classified in the form of government sponsors and private ones which due to the economy, politic, religion and culture can affect the artist’s life, his art making and discursive conditions in society. Recognition of contemporary supportive centers with such mythical role can help the jeweler to know his relation with the sponsor.